Sorry Harley, even though you look so cute Santa won't be here for a few weeks. We wish you could get him here sooner since it's so hard to be good. 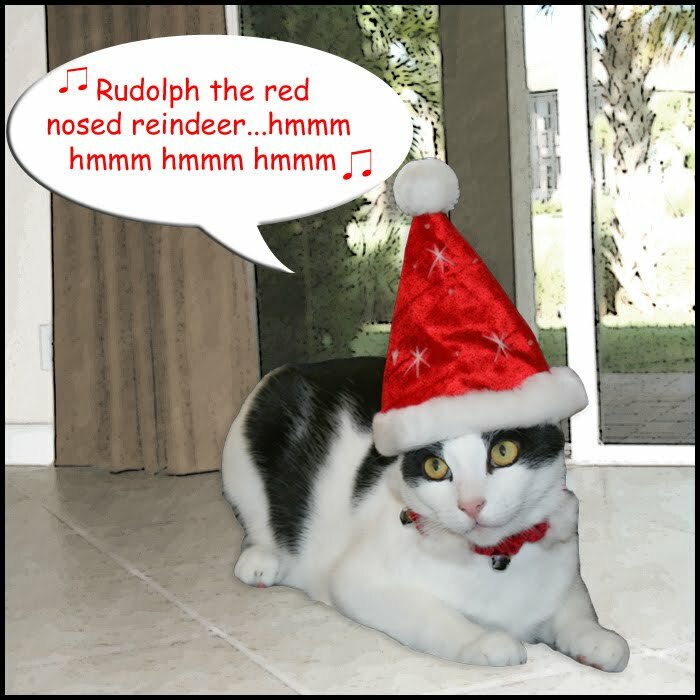 Harley, I don't know if the Rudolph headgear will get Santa here any sooner, but it IS perfect on you! Good luck with your plan Harley! You betcha. Red noses get Santas attention every time. Good luck. Let us know if you see him. 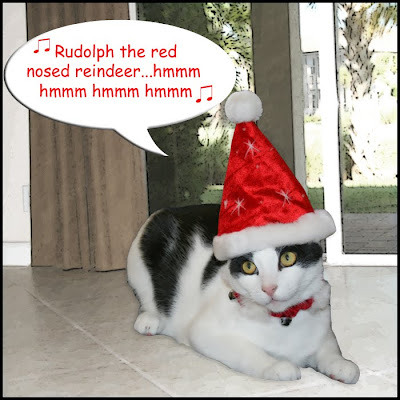 If it werks ~ can I borrow yoor red nose please? You can't hurry time... but if you practice patience, it will be here sooner than you think! P.S. I saw Santa at Bass Pro Shop this weekend. mom goes nuts when we talk about Santa.... I really don't understand why. 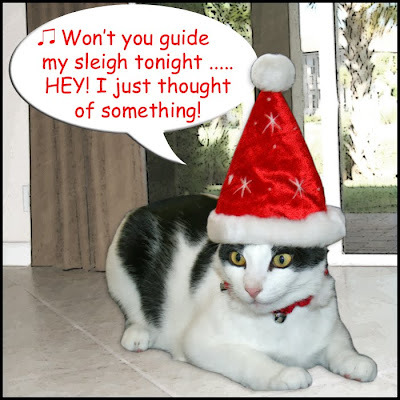 Harley, I should be right over there next to you singing Christmas songs! You look ready and I know Santa is watching Miles a LOT! 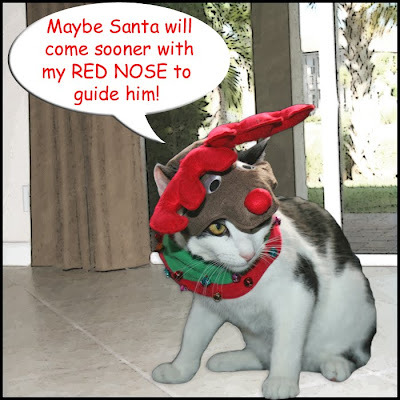 Harley, we think that Red nose will certainly get Santa to come sooner. It will guide Santa right to your house. Have you been being good??? Love the hat too. Don't rush it, Harley--I've got LOTS to do before then! We don't think Santa will get there early Harley cos he's an old man. Be patient, Harley...and you'll get lots of treats and toys for Christmas. It's worth a try! And you DO look very festive, Harley! That'll work it comes mighty fast all right !! You are sooo cute Harley! We hope Santa gets the message and comes faster! It't too soon to be waiting for Santa - don't believe everything you see! WE think you need to run and play for another month or so before sitting and waiting! Good try Harley but we don't think that will work. Harley you are SO adorable. I just had to come back and say that. it myt werk. keep tryin. One can hope Harley, one can hope! Harley, you are so cute we hope Sandy Clawrs makes an exception for you! He's getting closer every day! Oh we have a long time till Santa comes...you two just settle down now! I think we have to wait a little longer for Santa. I do not like waiting! Not for foods. Not for Santa. Rats! Great idea, Harley! Love the change of hats. I hope no reindeer were injured in the making of that last one, though. That was good thinking Harley but I think you're still going to have to wait a little longer. Well it was worth a try Harley! Maybe you can get a pre-Christmas gift for being so cute! 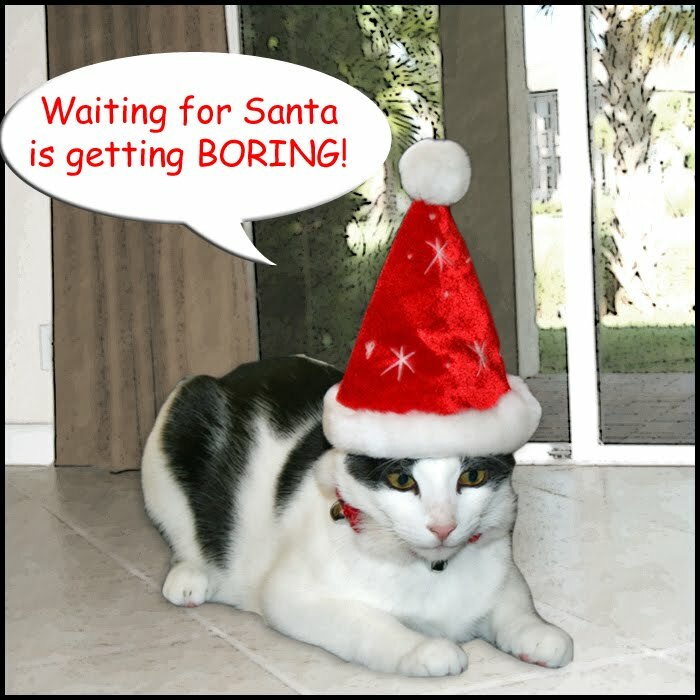 MOL you has a while to wait, maybe get some noms and toys to pass the time? you cans visit cat land if you wanna =^_^= you sure are cute in your hats! Oh Harley, I can't wait for Santa either! I'm so excited about the prickly tree and the fun things under it that I can rip up! My human gave me my christmas presents early though because she said she was embarassed to walk me in my old collar and leash....hmmph! It's going to be a long wait, Harley! I don't know if you can take wearing that hat for that long! I hope your plan works, Harley! Please Harley! Don't even PRETEND to work for some stupid Human in a red suit! Um, Harley, we sure hope you like wearing that red nose because it's going to be a LONG wait!